How realistic is it to expect a global event to be entirely detached from global politics? 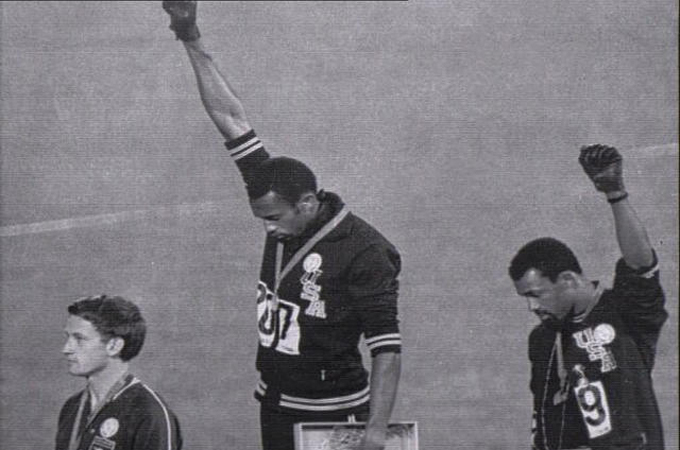 "Two disaffected black athletes from the United States put on a public display of petulance that sparked one of the most unpleasant controversies in Olympics history and turned the high drama of the games into theatre of the absurd." That is how the Time Magazine chose to describe the now iconic scene of Tommie Smith and John Carlos raising black-gloved fists high while standing atop the medal pedestal and refusing to look at the American flag. The year, of course, was 1968. Months earlier, Martin Luther King Jr had been assassinated, and major riots took place that year and in the years prior. Nascent Civil Rights legislation was still entering into effect, and in many parts of the country, Jim Crow and segregationist laws continued to exist either on the books or in practice. Inside Story - Are the Olympics still relevant? But Smith and Carlos were denounced. Ultimately, they were expelled from the games. How dare they, as an International Olympics Committee spokesperson put it then , "breach the fundamental principles of the Olympic spirit"? How dare they? History vindicated Smith and Carlos. Today, as we have vibrant movements in the US demanding that black lives must matter, it is easier to see why the outrage directed by the American mainstream towards Smith and Carlos for their protest then should have been directed towards the heinous racism and institutional discrimination upon which their country was built and continues to suffer from instead. It was easier of course to ridicule the pair, call them petulant, militant and whatever else than to think about their protest and our society's complicity in their grievances. How realistic is it to expect a global event to be entirely detached from global politics? What is this 'Olympic spirit' that exists in a vacuum where the hearts and minds of humans and their connections to the political world suddenly go blank? I've thought about this episode much over the last several days as the Olympics in Brazil take place. Much attention was paid to two incidents between Arab and Israeli athletes. In one, a Lebanese group of athletes refused to share a bus with Israeli athletes, and in another, an Egyptian judoka refused to shake hands with his Israeli competitor after a bout. In the Western media, the Arabs were ridiculed for their stances. This was supposedly childish behaviour and did not fit with the spirit of sportsmanship. There was little discussion about the roots of the grievances or interpretations of the events as political acts. One particularly odious commentator used the episodes to diagnose the "Arab mind" as diseased. How realistic is it to expect a global event to be entirely detached from global politics? What is this "Olympic spirit" that exists in a vacuum where the hearts and minds of humans and their connections to the political world suddenly go blank? I wondered, was there not an instance where black African athletes refused to shake the hands of white athletes representing apartheid South Africa? Such instances were limited by the fact that apartheid South Africa was actually banned from the Olympics from 1964 until the fall of the apartheid regime. But still somehow the Olympic spirit was apolitical. The US boycotted the games in 1980 over the Soviet Union's invasion of Afghanistan, but still somehow the Olympic spirit was apolitical. Israel today is running a settler-colonial apartheid regime that has turned millions of Palestinians into refugees, second-class citizens and stateless peoples living under the jackboot of military occupation. It is wholeheartedly supported by the same Western states whose narratives derided acts of Arab protest against Israel at the Olympics. As a 1970s-era anti-apartheid poster campaigning to end an all-white South African cricket tour read: "If you could see their national sport, you might be less keen to see their cricket." The words appeared above an image of an apartheid regime police officer clubbing native blacks. Where is the Olympic spirit in that? In Palestine, the Olympic spirit exists in many hopeful souls. But it has also often been snuffed out by the vicious policies and actions of the Israeli state. I'm sure the Olympic spirit existed in the Bakr boys, the four young children playing football on a beach in Gaza before they were annihilated by shelling from Israeli naval ships. It also existed in those Palestinians who just weeks before that had been gathered to watch the football World Cup when an Israeli missile ended the gathering and their lives. It existed in the 8-year-old Palestinian girl in Hebron, who perhaps one day a could be a cyclist representing a free Palestine, until an Israeli soldier forcefully took her bicycle away, tossing it aside as she cried , all because she was nearing a neighbourhood street she wasn't allowed on because she isn't an 8-year old Jewish girl. It existed in 15-year-old Mahmoud Badran, who loved Real Madrid and playing football, and who was swimming with his cousins in a local pool earlier this summer. Might he one day swim for gold for Palestine? Alas, his life was taken on the way home from the pool that night when an Israeli soldier fired bullets - with no justification whatsoever - riddling the car he was in and injuring several others in the process. I can understand the desire for sportsmanship and, as a lover of sport myself, I appreciate the ways in which it, as a human language, can transcend divides. What I cannot understand and cannot accept, however, is when there is outrage over simple acts of protest without outrage, or even discussion, in those same conversations about the reasons behind those protests - the mass denial of basic human rights to millions of Palestinians. If that is your idea of the Olympic spirit, then it is a spirit I want no part of. I suspect, though, as the test of time has proven with Smith and Carlos, that the day will come when those who are more outraged at the protest against Israel than they are at Israel's treatment of Palestinians will hang their heads in shame.